The curved lines and bean-like shape are just the beginning of this settee’s intriguing construction. 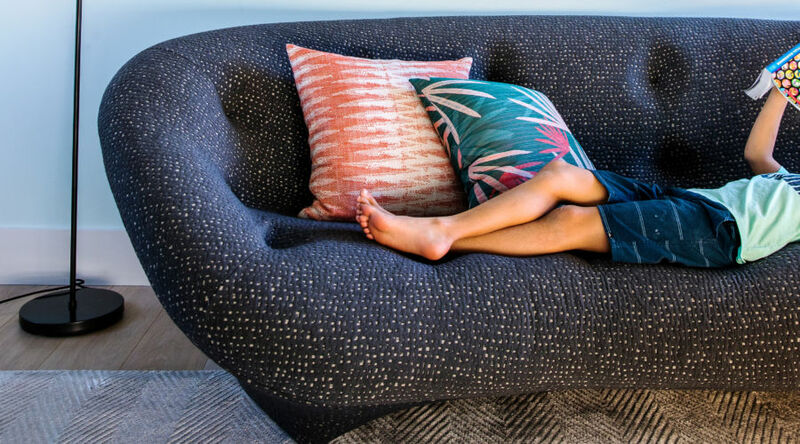 An asymmetrical design, with a higher backrest on one side and a deeper seat on the other, offers different ways to nestle in; stretchable upholstery (with a cool texture to boot) and ultra-soft foam make it a perch you’ll never want to leave. Heritage materials meet modern construction in this stunner made of polished brass, leather belts, natural webbing, and (our favorite element) military canvas upholstery. The result is a look that’s both relaxed and chic. There’s no shame in designing an entire room around a statement piece, just as you would an outfit. In this case, the homeowner splurged on the Orla Kiely Lusk sofa in a vivid tomato red. 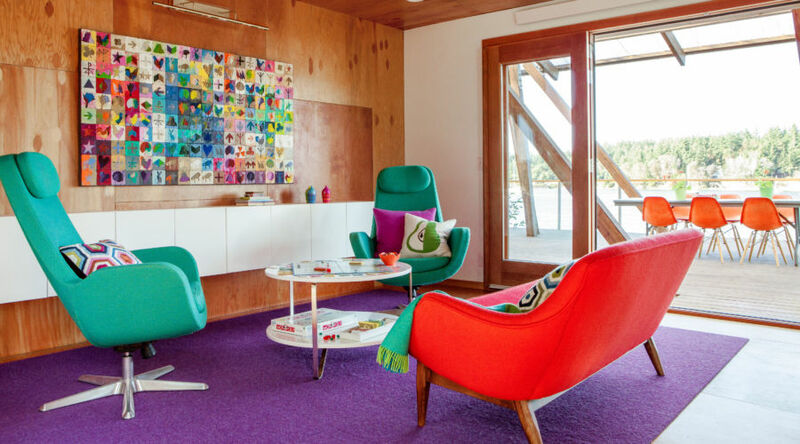 Ikea chairs were reupholstered in turquoise wool and paired with the violet rug and a colorful piece of art to complete the cheerful crayon box vibe. 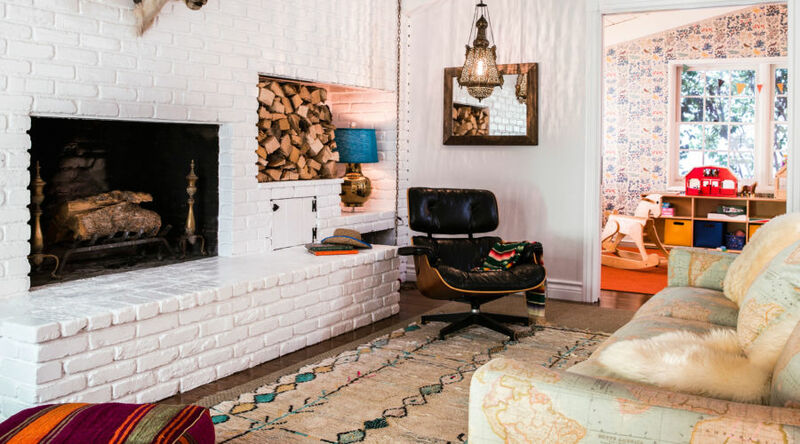 In this Southwestern home, it felt appropriate to swap the sofa for a banco, traditional built-in seating constructed from adobe brick, wire, and plaster. 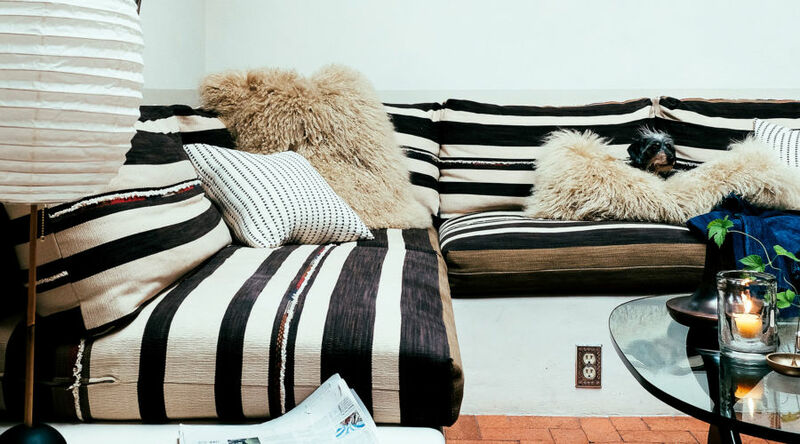 As the designer and homeowner Susan Stella says, “When you’re dealing with a small space, built-ins help things feel less cluttered.” The graphic cushions in wide black-and-white stripes give the look additional polish, while the fluffy pillows soften it up. To wake up a neutral palette, you can splash on bright color or use pattern. But why not combine the two? Here, an orange paisley-print settee provides an inviting burst of cheer and pops against the sky-blue walls and white fireplace. 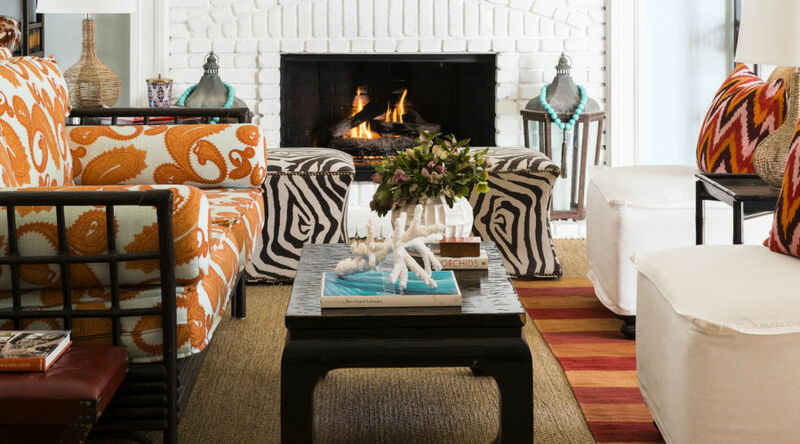 The zebra ottomans throw in an extra dash of funkiness. 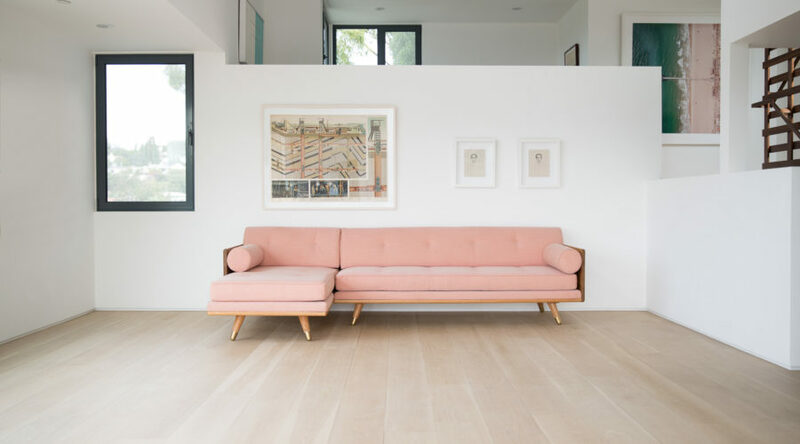 Millennial Pink is still in vogue, and this couch puts it front and center. 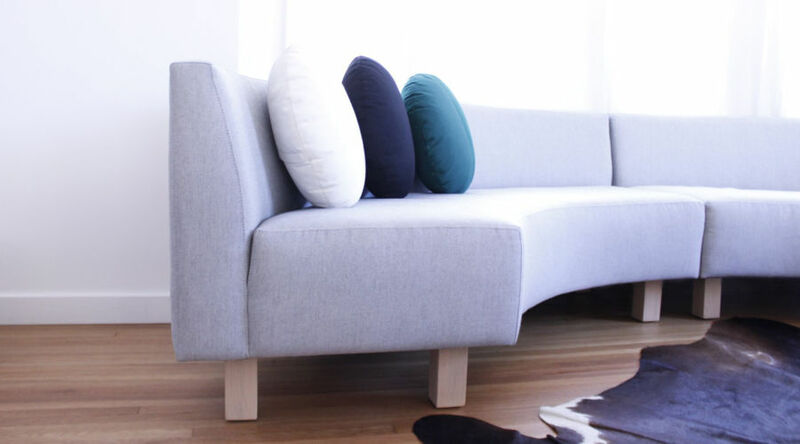 For the shape that best fits your space, choose from a traditional sofa or chaise. We personally can’t resist the idea of kicking up our heels on the arrangement as pictured, with the two pieces combined into a stylish sectional. Color is a surefire way to make a statement in any space, and this bold-hued sofa gets right to the point. 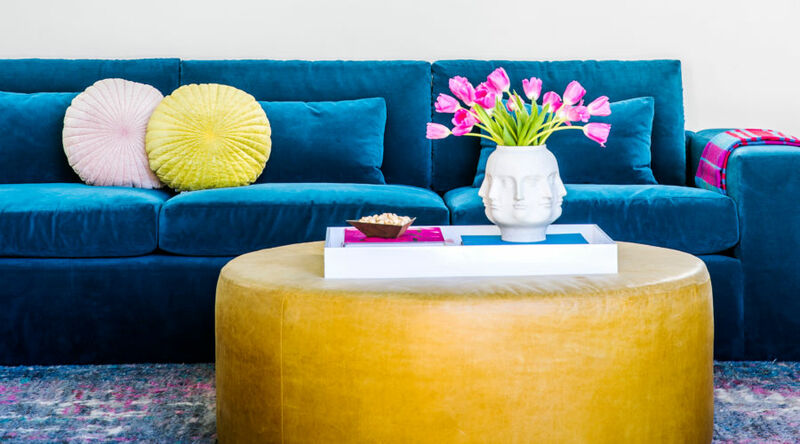 Upholstered in rich, sapphire-hued velvet, the piece packs a punch and anchors the entire space. While some might shy away from piling on more color, we love how this seating area plays with an unconventional palette by balancing the blue with blush, magenta, and citron. This sofa was made, both literally and figuratively, for a jet-setting lover of pattern. A traditional shape gets visual interest from custom upholstery featuring a map of the world. The print mixes well with the other globally-inspired textiles in the rug and ottoman; all together, they pop against the white brick wall. A leather sofa is both wondrously soft and smooth to sit on, and a cinch to clean. What’s not to love? 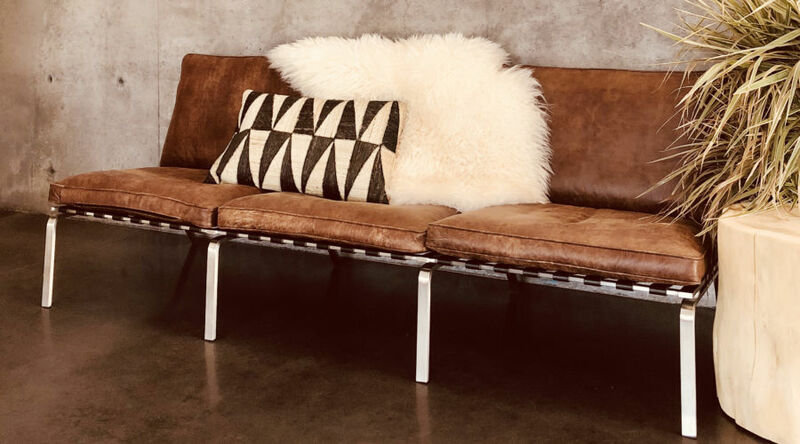 This number, with chestnut leather cushions resting atop a stainless steel frame, doesn’t have to shout to grab attention. It’s quietly gorgeous in any space. 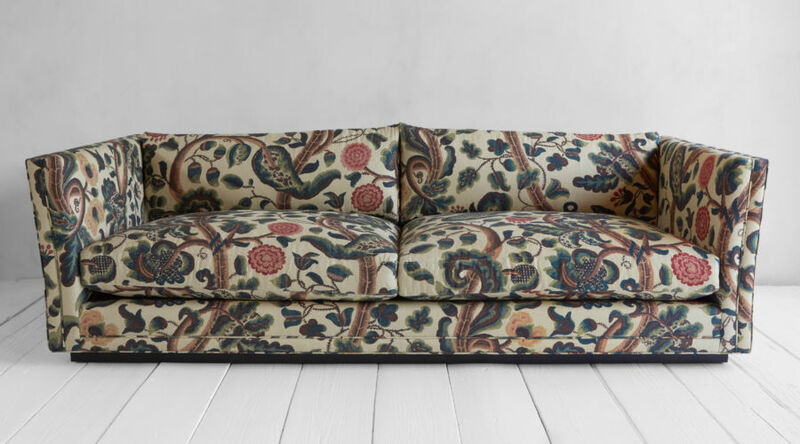 Handmade in Los Angeles this boho-chic sofa with an eye-catching botanical pattern also boasts extra-deep seating that’ll make you feel like you’re sinking into a garden of earthly delights. 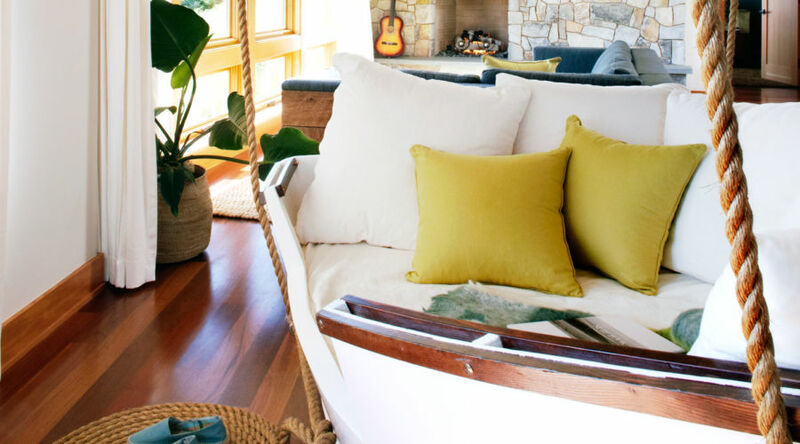 For a playful twist on a sofa in this modern beach house, an old sailboat was converted into seating. Suspended by rope, the nautical look is enhanced without veering into the realm of kitschy. This curved number is perfect for party seating, as the semi-circular shape brings people on the ends together. 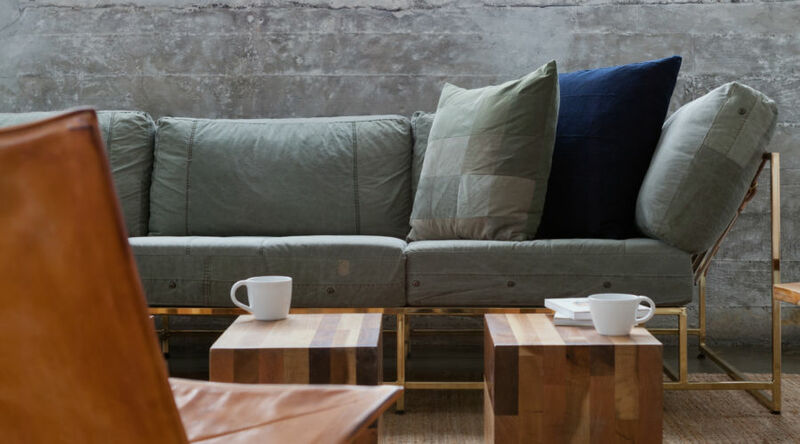 Even better, you can connect several pieces for the sectional sofa of your dreams.